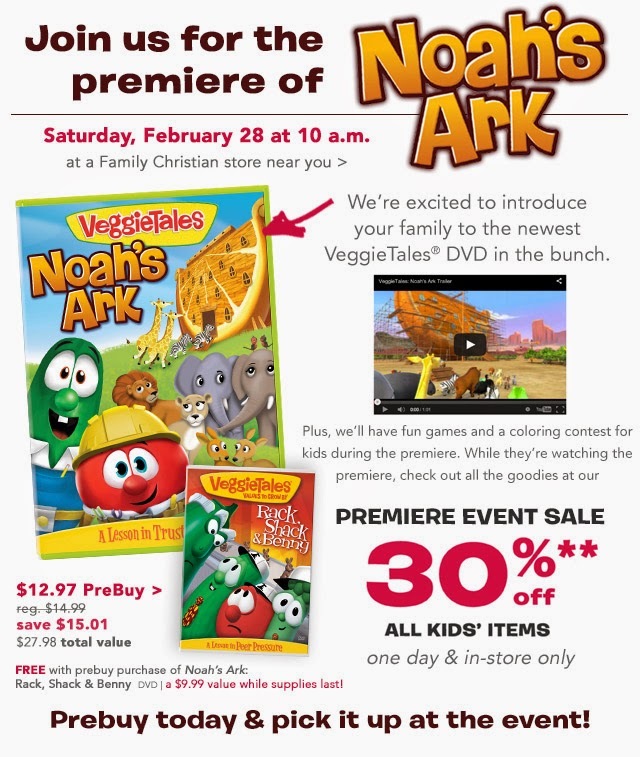 Parents, our children are in for a special treat a brand new Veggie Tales is being released Saturday, February 28, 2015 at your local Family Christian store. This time Veggie Tales has decided to teach our kids about the story of Noah’s Ark and listening to God and trusting Him to keep His promises. The DVD features the voices of best-selling Christian artist, Jaci Velasquez and comedian and actor, Wayne Brady. And to celebrate the dramatic release every single Family Christian store will be premiering the DVD at 10 am. There will also be a coloring contest for the kids to enjoy and they will also play a few fun games. But wait there is more! To add to all of the excitement, Family Christian is having a gigantic one day in store only sell and they are offering 30% off of everything in the kids dept. Noah’s Ark is available for preorder right now for a special price of $12.97 and you can preorder and pick it up at the event! And an added bonus, when you preorder before February 28, you also get an extraordinary DVD, Veggie Tales: Rack, Shack & Benny and this is the story of Shadrack, Meshack and Abendego while supplies last. This is also an added value of $9.99! You can’t beat this deal two Veggie Tales DVDs for the price of one! So parents if you need some entertainment for your children this Saturday, take your children to your local Family Christian and have some friendly family fun while watching this brand new DVD! I would recommend this life changing book to every single parent who are seeking information about how to be the best parent they can be. Even though I'm single and I don't have kids yet this book taught me a lot about parenting, leading our children in the right direction, and instilling Christian principles in their lives. I also plan to reread this book whenever that time does come. Michelle Anthony writes in a practical way where parents can connect with. I really like how she walked readers through the six different dysfunctional parenting styles. She also helps readers to improve in their Christian parenting. My favorite chapter was entitled, "A Time to Bless" because she included powerful blessings from scripture that we can declare over our children's life. This is something I strongly believe will tremendous benefit children and it could literally change their entire lives. I really loved the blessing of being an overcomer based off of 1 John 4:4 and 5:4. This one reminds our kids that through Christ they have the victory and they are more than a conqueror. I also enjoyed that she recommended parents to read Numbers 6:22-26 aloud over their children. Numbers 6:22-26 is a passage about God blessing them, protecting them, God being gracious to them, and giving them peace. Speaking out loud blessings over my children is something that I want to do for my future children. I also liked the father's nod and this is something every man is longing for from his father. This is something I will strive to do for my kids. I want to make sure they know I'm proud of them. If you’re looking for an excellent book about parenting, check out this book! 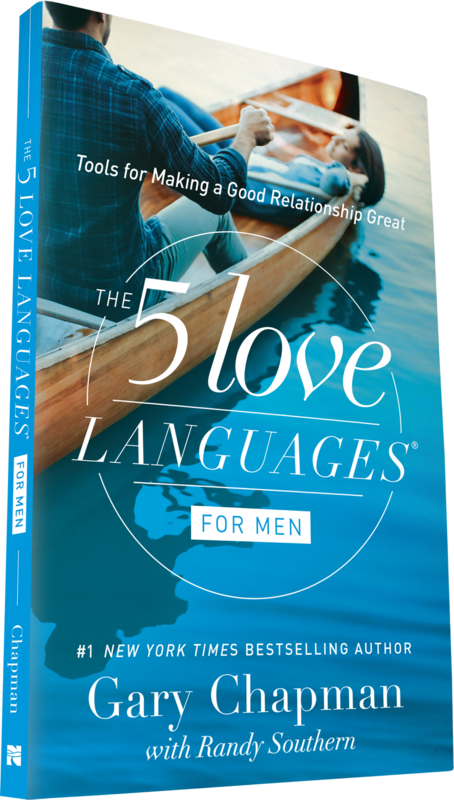 In 5 Love Languages for Men, Gary Chapman discussed the five love languages and how to learn how to communicate love to your wife. The five different love languages are words of affirmation, acts of service, receiving gifts, quality time, and physical touch. Everyone speaks love in a different way and this book was written to help you discover the five different ways people receive love. 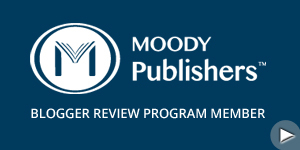 The book also covered troubleshooting, anger management, and the art of apologizing. It also had a section containing frequently asked questions and profile questions for him/her. I would recommend this life changing book to every single men that is determined to find out their spouses love language. Women are free to read it as well but this particular book is written in a style more catered to men. I really enjoyed how Gary Chapman walked readers through the different love languages. I also liked that he included suggestions after each chapter to assist people in ideas on how to enact the love language and how to fill their spouses love tank. I loved how it included drawings throughout to present the information. Personally, I’m not married so it is a little challenging to discover my wife’s love language when I haven’t even met her yet. But the book still taught me the different ways people perceive and receive love. I plan to reread this book whenever I get into another relationship and again while I’m engaged and even when I get married, because I’m sure I will need a refresher course. While reading this book, I learned my primary love language is words of affirmation and when I receive a positive comment, it means a lot to me but when I receive a negative one it brings me down. Encouragement helps me to soar higher and try harder to be the best I can be. This would make an excellent gift to sons, engaged men, and married men. If you’re looking for a book, that will change your marriage for the better then read this one! I’m a member of the Family Christian Bloggers and they provided me with an appreciation certificate to purchase a free copy of The Faith of American’s Presidents for this review. To celebrate President’s Day, I decided to share some of the things I learned while reading The Faith of American’s Presidents. This book was released in 2007 and it covered 42 presidents. It explored which presidents had faith in God and which didn’t believe in the Christian faith. I have chosen three presidents to share about in this blog post. Woodrow Wilson was elected to be the 28th president of the United States in 1912. A little background about President Woodrow Wilson, his father, Joseph was a Presbyterian preacher. He believed strongly that Sunday school wouldn’t be beneficial to his family and he thought parents were supposed to be teaching their own children about the word of God. Woodrow even continued this legacy when he raised his own three daughters. At age 17, he accepted Christ after attending a service where Frank J. Brooke preached. He joined the First Presbyterian Church in Columbia, South Carolina. This book included a journal entry from this time and it showed that he was upset about how he felt he sinned and how he wants to receive grace where he can serve Jesus more fully from now on. Wilson attended Davidson College and he took Bible courses in order to grow in his faith and he strived in becoming a professor. The book even revealed that he prayed and believed in reading the Bible regularly and he attended church every week. On the Sabbath though he sturdily refused to even read a newspaper. He married his wife, Ellen Louise Axson in 1885. In 1902, Wilson become president of Princeton University. The book shared a speech he made regarding Christian education and parents key role. Some of his important points included teaching your children about being a Christian and we can’t expect them to be a Christian if we don’t act like Christians. He believed that the home was the foundation for children learning about Christ. He also felt Christians were placing too much emphasis on trying to scare our children into receiving salvation for the fear of going to hell. He felt we need to teach our children about having a true relationship with Christ. Throughout his presidency, he stayed connected to his Heavenly father. In his second inaugural address speech, he admitted to praying to God for wisdom and for the strength to be the leader he needed to be. He also felt there needed to be unity in the United States. He was also quoted at a speech in North Carolina saying, “our country cannot survive materially unless it be redeemed spiritually”. The book also covered President James Abram Garfield. In 1831, he was elected the 20th president of the United States. Let’s take a look at a little background, he was saved when he was 19 years old at a camp meeting when William Lillie was preaching. He became a member of Disciples of Christ and they focus primary on the Bible’s teachings and they believe you can only join the church when you receive Jesus and you get baptized. In 1853, he began preaching in churches and the majority of his messages was centered on God’s love for His people. He strongly believed we need to have a relationship with Christ and seek to be good and we must find our purpose in life. He loved debating about God and religion during his college years. He was quoted as stating, “Christians have no right to participate in human governments.” This is something Disciples of Christ firmly believed against. He later changed his mind and ran for president. He was the only preacher who have ever been a president. During his presidency, he felt strongly that slavery was sin and the United States paid for that sin with the Civil War. As we all know, an assassin, Charles Guiteau shot the president in 1881. They discovered a letter from Charles explaining why he did it. He felt that the president would be happier in Heaven than here and he said he had no hard feeling towards the president. Ronald Wilson Reagan was elected president of the United States in 1981. He was raised a Protestant and a book written by Harold Bell Wright, “The Printer of Udell’s” and it had such an impact on his life that he decided to get received salvation and get baptized. He even did some preaching in his teens and he taught Sunday school. He also chased his dream of being in movies and he was the leader of the Screen Actors Guild and he tried to prevent Communists from controlling Hollywood. He also hosted his own radio commentary for several years. He talked mostly about political issues and occasionally about Jesus. He also admitted that he believed the Bible was divinely written and he wholeheartedly believed in it. When he made his inaugural speech he expressed that this nation was one nation under God and God has allowed us to free. It declared that it was essential to make Inauguration Day a day of prayer. During his first year at being president he had an assassination attempt and it caused him to lean more on God and he knew he owed everything to God. He had to quit attending church while in office but he had communion at the White House. During his term, he tried passing an amendment that allowed voluntary school prayer and it was reject. Reagan also was very vocal against abortion. He stated, “Our Constitution guarantees life, liberty, and the pursuit of happiness.” And used his phase to try and protect unborn children. He also declared January 17 to be “Sanctity of Human Life Day”. He even declared May 7 to be the “National Day of Prayer”. He believe it was time for us to pray and seek God’s guidance. I would recommend this interesting book to anyone who has an interest in discovering what our leaders believed in and what they stood for. I felt this book was very well written and thoroughly researched. Even though I have taken many history courses in school, this book taught me many different things about our presidents and their faith or lack of faith in Christ. I also strongly believe if we would seek God first in our lives and turn back as a nation and worship Christ for the loving Creator he truly is, we would see the nation radically change for the better! If you’re looking for a Christian historical book to read about our presidents, then read this book! In Team Us, Ashleigh Slater shared the importance of striving to have a marriage that is focused on unity and centered on Jesus and His teachings. Ashleigh and her husband, Ted have been married for eleven years. She strongly believes that husband and wife should be on the same team and they must work hard on fighting to keep their marriage together. She begins the book by looking at the first couple in the Bible, Adam and Eve. God stated that it isn’t good for man to be alone and He meant for us to have a God ordained marriage and be united and committed to our spouse. When sin entered the picture it changed everything and it has become much more difficult to stay together under a marriage covenant. Throughout the book, she explains key principles to help you strengthened your marriage. I would recommend this life changing book to every marriage couple, newly wed, recently engaged, and single people wanting to prepare for their future marriage. I’m currently single and not married and this book taught me a lot about marriage and how to strengthen my future marriage. One of the key principles, Ashleigh Slater taught readers was why grace is crucial especially in your marriage. Like God freely gives us grace we must also freely give it to our spouse. I personally think this sometimes can seem the most challenging particularly when our spouse lets us down or hurts us. When we are tempted to continue fighting with our spouse, imagine a concept of grace could help heal and strengthen our marriage. I also liked how on one of their first dates, Ashleigh and Ted wrote down a list of qualities they wanted to see in their relationship. And they tried to stick to them throughout their relationship which eventually led to marriage. I also enjoyed how she also had “Ted says” section throughout the chapters and it benefited to see how Ted felt at times. I also believe that readers will get a lot out of the “Us Time” at the end of each chapter featuring questions for couples to answer together. If you’re looking for an amazing book to help improve your marriage, then read this one!